Watch the photos of Angie's trek! Once Around the Lake should be titled “It’s Never Too Late”. 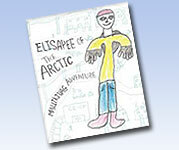 The book I started in 2003 after walking 1000 km around Lake Ontario is back on track. I’m going to reformat the 69 pages I wrote during the SARS crisis as part trip down memory lane and part fact book about Lake Ontario. Did you know that the deepest part of Lake Ontario is around 240 metres? That means just 60 metres of the tallest building in Canada, First Canadian Place, would stick out in the deepest part of the Rochester Basin. Be part of an arts project that gives a voice to a new Hero of the North. 2009 exhibition and show, check website for details! The Art of Dissent: Willy Fick prepared for Toronto's Holocaust Education Week (Holocaust Education Centre/Lonsdale Gallery, Nov 2009) lives on through its catalogue and teaching materials. Case Studies, Lessons, Images and Fact Sheets that enhance facets of Ontario Ministry of Education curricula (see sample lessons) are available at angielittlefield.com and also at readingandremembrance.ca a website dedicated to teaching resources for Remembrance Day. "Thanks to former Holocaust Centre Executive Director, Jennifer Ritter, we have a permanent, readily accessible and usable resource for remembrance, including Holocaust Studies", says exhibition curator Angelika Littlefield. Photo: Experiment Kalltal: Cologne Progressives in Simonskall. The photo shows Angelika Hoerle, Anton Räderscheidt (1892 - 1970), Marta Hegemann and Heinrich Hoerle. Marta and Anton were husband and wife at this point. The foursome visited Simonskall sometimes between 1919 and 1921. Painting as weapon: progressive cologne 1920-33 curated by Dr. Lynette Roth for the Museum Ludwig opens with Angelika Hoerle: Cologne Comet of the Avante-Garde 1912-1923 at the Art Gallery of Ontario May 23, 2009. Although the AGO exhibition follows the Ludwig's (Cologne, March - June, 2008), it is historically its forerunner. Franz W. Seiwert and Heinrich Hoerle, two of the three Progressive artists to be featured in Toronto, cut their teeth at the same time and in mostly the same places as Angelika Hoerle. They evolved their leftist art-political philosophy during anti-war meetings at the home of Carl Oskar and Kaethe Jatho during1916-18, the sojourns in the Eifel mountain retreat of Simonskall (1919-1921) and the Hildebold Square exhibitions of the group calling itself Stupid (1920). The seeds of the way in which the two Hoerles and Seiwert wanted "to construct" a new world, blossomed in the works of the Cologne Progressives. The AGO's Angelika Hoerle exhibition travels to Museum Ludwig for the fall 2009. "Eighty-six years after her death, Cologne's daughter, Angelika Fick-Hoerle, returns to her homeland in triumph", says Angelika Littlefield, curator and Hoerle's grand-niece. "My family is proud that the AGO has made this possible." March 2008: at the Junkershaus Gallery Experiment Kalltal: the Cologne Progressives in Simonskall. This exhibition set the scene for the Museum Ludwig exhibition. Professor Walter Dohmen, a print expert, did a demonstration print from original Angelika and Heinrich Hoerle linoblocks which my husband and I are sent over for this exhibition. A very limited portfolio with five prints will be available from these 1919-1921 blocks. This exhibition sets the scene for the Museum Ludwig exhibition. Professor Walter Dohmen, a print expert, curates and will do a demonstration print from original Angelika and Heinrich Hoerle linoblocks which my husband and I are sending over for this exhibition. A very limited portfolio with five prints will be available from these 1919-1921 blocks. Having the Honourary Patronship of this extraordinary exhibition arranged by Franz Tiedtke for Hohen Art was as great as meeting my good friend MAF Raederscheidt again. MAF's grandmother Marta Hegemann and my great-aunt Angelika Hoerle, were the best of friends in Cologne in the World War I era. It was fitting that both of us were able to share reminiscences about these fine artists with an audience that overfilled the Marienkapelle in Huertgenwald. 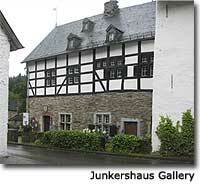 The photos from the opening of the exhibition which ran from Mar to June 2008 in the Junkerhaus Gallery in the impressive Eiffel Mountains, show the wonderful natural setting to which the Cologne artists withdrew to read, discuss and create art. This show will come to the AGO May 23 to August 30, 2009. Schirmherrin Angie Littlefield (rechts) und Maf Räderscheidt (links) ließen den großen Geist der Künstler der Kalltalgemeinschaft ins Junkerhaus zurückkehren. Patron Angie Littlefield (right) and Maf Räderscheidt (left) were the major artists of the spirit of the gentleman Kalltalgemeinschaft return home. Die Ausstellung "Experiment Kalltalgemienschaft - Die Kölner Progressiven in Simonskall" des Kunstvereins HöhenArt Hürtgenwald, unterstützt von der Konejung Stiftung Kultur, im Junkerhaus Simonskall erinnert an eine wichtige Episode im Kunstleben der Rheinischen Moderne. The exhibition "experiment Kalltalgemienschaft - The Cologne Progressives in Simonskall" of the art association HöhenArt Hürtgenwald, supported by the young Kone Culture Foundation, Junker house Simonskall reminiscent of an important episode in the art life of the Rheinische modernity. Zwischen 1919 und 1921 hatten einige Kölner Künstler und Intellektuelle, unter ihnen die Schriftstellerin Käthe Jatho-Zimmermann, der Kunsthistoriker und Publizist Carl Oskar Jatho und der Graphiker und Maler Franz Wilhelm Seiwert, in Simonskall eine Art Künstlerkolonie gegründet - die Kalltalgemeinschaft. Between 1919 and 1921 Cologne had a few artists and intellectuals, among them the writer Käthe Jatho-Zimmermann, the art historian and journalist Carl Oskar Jatho and the graphic artist and painter Franz Wilhelm Seiwert, Simonskall a kind of artists' colony founded - the Kalltalgemeinschaft. An die 80 Exponate, Bilder, Graphiken und Schriftstücke, sind im Junkerhaus zu sehen. At the 80 exhibits, photos, graphics and documents are in the house to see Junker. Alle ausgestellten Künstler seien Mitglieder oder Freunde der Kalltalgemeinschaft gewesen, betont Dr. Reinhard Schilf, Mitglied des Kunstvereins HöhenArt. All artists were exhibited members or friends of Kalltalgemeinschaft been said Dr. Reinhard Reed, a member of the Kunstverein HöhenArt. Zu den Freunden zählten unter anderem Angelika und Heinrich Hoerle, Martha Hegemann und Anton Räderscheidt. 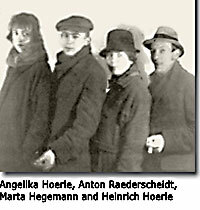 The friends included Angelika and Heinrich Hoerle, Martha Hegemann and Anton Räderscheidt. "Wir wollten etwas ganz besonderes machen", erläutert Franz Tiedtke vom Verein HöhenArt die Intention für die Ausstellung. "We wanted something special," explained Franz Tiedtke HöhenArt by the association's intention for the exhibition. "Wir wollten daran erinnern, dass es die diese Künstlerkolonie gab, mit heute recht bekannten Künstlern"
"We wanted to remind you that these artists' colony was now quite familiar with artists"
Als Schirmherrin der Ausstellung konnte Angie Littlefield, die Großnichte von Angelika Hoerle, gewonnen werden. 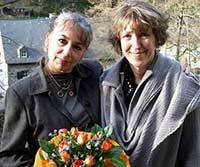 As a patron of the exhibition was Angie Littlefield, the great niece of Angelika Hoerle, won. Sie sei stolz, nicht nur ihre Familie vertreten zu dürfen, sondern auch die Leistungen ihrer Großtante zu würdigen. She was proud, not only their family to be represented, but also the performance of their Great Aunt assessed. "Die Kalltalgemeinschaft war die Wiege der Kölner Progressiven", erläuterte Littlefield. "The Kalltalgemeinschaft was the cradle of Cologne Progressives," said Littlefield. Trotz des dramatischen Erlebnisses des Ersten Weltkrieges hätte hier die Hoffnung überlebt, dass Kunst zur Weltverbesserung dienen kann. Despite the dramatic experience of the First World War had survived the hope that art to the world a better serve. Dass die Ideen der Gemeinschaft auch nach 90 Jahren noch "in der Welt herumgeistern", zeige, dass Freundschaft, durch die Künstlergemeinschaft gekennzeichnet war, zeitlos ist, so Littlefield. The fact that the ideas of the community after 90 years "in the world herumgeistern", shows that friendship, by the artistic community was marked, timeless, so Littlefield. Unterstützt durch Fotoprojektionen erzählte Littlefield aus dem Leben ihrer Großtante und gab auch einige Familienanekdoten preis. Supported by photo projections Littlefield told from the lives of their Great Aunt and gave some family anecdotes price. Maf Räderscheidt, Enkeltochter von Marta Hegemann und Anton Räderscheidt, ging auf die Biographie ihres Großvaters ein, bevor sie ihre Großmutter Martha Hegemann mittels vorgetragenem Tagebucheintrag selbst zu Wort kommen ließ. Maf Räderscheidt, grandson, daughter of Marta Hegemann and Anton Räderscheidt, went to the biography of her grandfather, before her grandmother Martha Hegemann using vorgetragenem diary entry even to speak it. Die Einführung in die Ausstellung übernahm Professor Dr. Gertrude Cepl-Kaufmann aus Düsseldorf. The introduction to the exhibition over Professor Dr. Gertrude Cepl-Kaufmann from Dusseldorf. Die Kalltalgemeinschaft sei durch junge Künstler ins Leben gerufen worden, die der Leidensgeneration angehört hätten und mit ihrer Kunst nach Rettung suchten. The Kalltalgemeinschaft by young artists was launched, the generation of passion and had consulted with their art to rescue searched. Zu den ausgestellten Werken zählen neben Linol- und Holzschnitten, Zeichnungen und Aquarellen auch Erzeugnisse der "Kalltalpresse", die vermutlich in Simonskall gedruckt worden sind. Among the exhibited works include linocuts and woodcuts, drawings and watercolors also products of "Kalltalpresse", allegedly involved in Simonskall been printed. Acht Werke dieser literarischen, zum Teil graphisch illustrierten Texte sind im Junkerhaus zu sehen. Eight of these literary works, sometimes graphically illustrated texts are in the house to see Junker. Zum Thema "Originale Druckstöcke der Kalltalgemeinschaft auf historischer Handpresse" wird Professor Walter Dohmen am Sonntag, dem 4. Professor Walter Dohmen on Sunday, 4 Mai, von 11 bis 14 Uhr einen Vortrag mit Demonstration halten. May, 11 to 14 clock with a lecture demonstration. Die Ausstellung "Experiment Kalltalgemeinschaft" ist bis zum 15. The exhibition "Kalltalgemeinschaft experiment" to 15 Juni mittwochs und samstags von 14 bis 18 Uhr, sonn- und feiertags von 12 bis 18 Uhr im Junkerhaus Simonskall zu sehen. Wednesdays and Saturdays June 14 to 18 clock, Sundays and public holidays from 12 to 18 clock in the house Junker Simonskall to see. Walking with Oma, my 780 km trek along the Elbe River from the concentration camp Terezin to Hamburg starts April 2008. The 48 day walk is a homage to my oma, Anna Skraika Schilling, who left Terezin on her own in May 1945 to see if anything of of her life remained in Hamburg. I will feature parts of the walk on this website with posts en route. The sad photo of my oma was taken in 1945 right after the war....I think it might even have been her i.d. photo issued by Terezin. The smiling one is in the 1950s; she's remarried a musician and is much happier. These 'light' and 'dark' moods remained with her all her life as a result of the concentration camp experience. There’s a whole series of these very educational books. As an educator for 33 years, curator for 20, playwright and published author, I have a lot of experience. Whether you need speech or grant writing, presentations or seminar, research or editing, or you are interested in exhibitions to do with dada or degenerate art I will be able to tailor something to your needs.